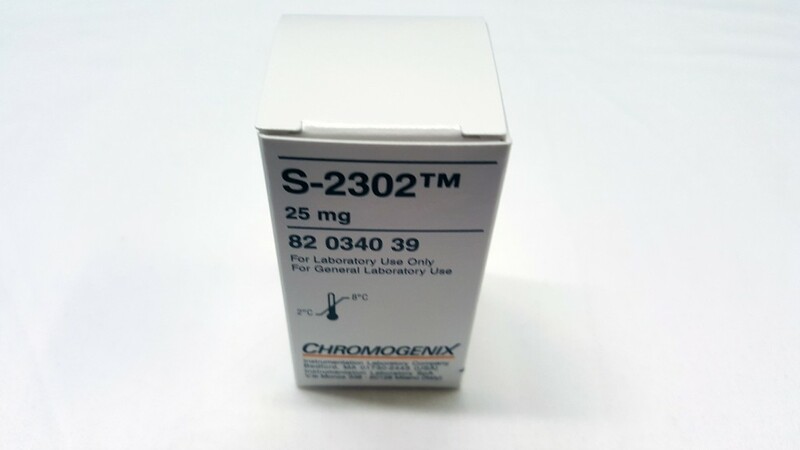 Each vial contains chromogenic substrate S-2302™ 25 mg and mannitol 60 mg as a bulking agent. Stability: Substance: Stable until expiry date if stored at 2-8°C. Avoid exposure to light. The substance is hygroscopic and should be stored dry. Solution: 4 mmol/l in H2O is stable for more than 6 months at 2-8°C. S-2366™ is also readily split by trypsin, thrombin, plasmin and tissue plasminogen activator. It is split by FXIIa, plasma kallikrein and FXa as well.The method for the determination of activity is based on the difference in absorbance (optical density) between the pNA formed and the original substrate. The rate of pNA formation, i.e. the increase in absorbance per second at 405 nm, is proportional to the enzymatic activity and is conveniently determined with a photometer.